No need to play bartender at your next brunch. 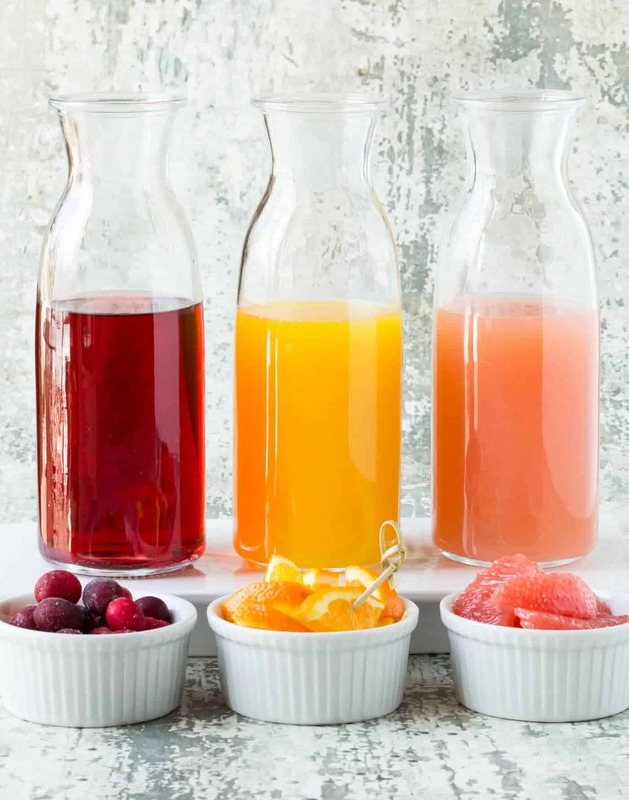 Just follow our guide for How to set up an Easy DIY Mimosa Bar and let guests serve themselves! Every host or hostess faces the challenge of how to balance your time between serving your guests and enjoying the party with them. That’s why we offer loads of tips on Garnish with Lemon about how to make all (or portions) of recipes in advance and tons of shortcuts to cut down on prep and serving times. 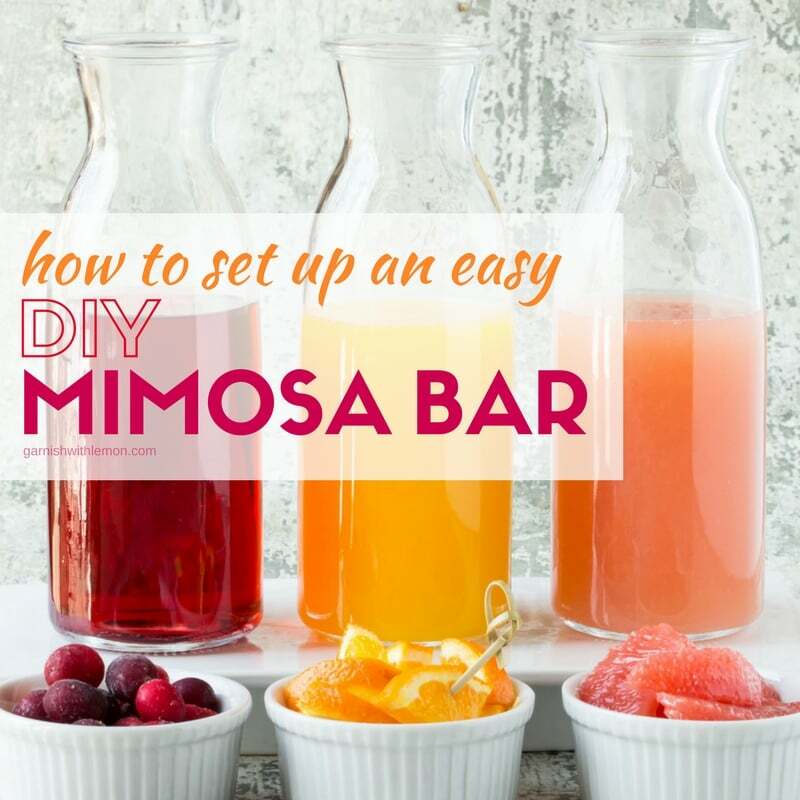 With spring approaching and numerous opportunities for brunch (hello graduations, Mother’s Day, wedding showers), we knew the timing couldn’t be more perfect for our tips on how to set up an Easy DIY Mimosa Bar. Buy drinkable bubbles. I know it’s tempting to cheap out on the sparkling wine since it’s being mixed with fruit juice, but don’t do that. Some of your guests might forego the juice entirely and enjoy a glass of straight-up bubbles. Stick with one of your favorite brands in the $10-20 range. Keep at least one bottle on ice on the mimosa bar and a couple of backup bottles chilled in the fridge. Use fresh juice. This is the time to seek out the fresh squeezed stuff if at all possible. The flavor difference is remarkable. We used three different juices in our set up, but feel free to use more if you have additional favorites. If you’re feeling crafty, you can label your juices with signs or stickers. We chose to simply place ramekins of the same fruit in front of each carafe to identify the juice in it. Add festive garnishes. Sure, guests can pop a bit of fruit into each glass, but also consider adding some fresh herb sprigs, like rosemary and mint, to your mimosa bar. Bonus points as these garnishes take the place of wine glass charms so everyone knows which glass is theirs. Keep the glasses unfussy. Don’t have a set of 12 perfectly matched champagne flutes? No worries. A contrasting collection of flutes, wine glasses and even martini glasses works equally as well in any casual DIY Mimosa Bar. 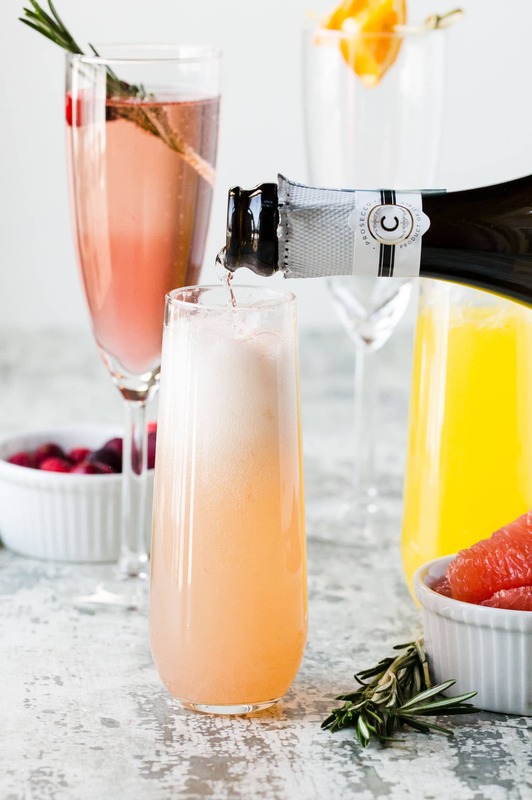 Looking for some menu ideas to go with your DIY Mimosa Bar? We have a Pinterest board dedicated to all things brunch. Don’t miss it!